April 2019 Spring is on it’s way (slowly)! WOW! 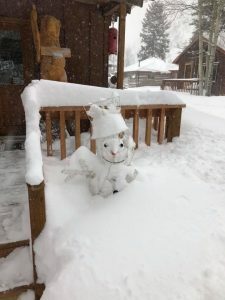 What a wonderful winter wonderland we experienced this year! The snow proved amazing and provided excellent skiing, snowmobiling, sledding, and so much more. Looking out our window, watching the snow fall, people laughing together, and the smell of burning firewood are all memories we will carry long into the spring. Those who joined us were not disappointed, and those who weren’t able to join us missed one great winter season. We loved seeing old friends, and making new ones. Spring is now in the air and we are ready for the sunshine to warm us, knowing well, that it will get pretty chilly once the sun goes down, or gets behind the clouds. 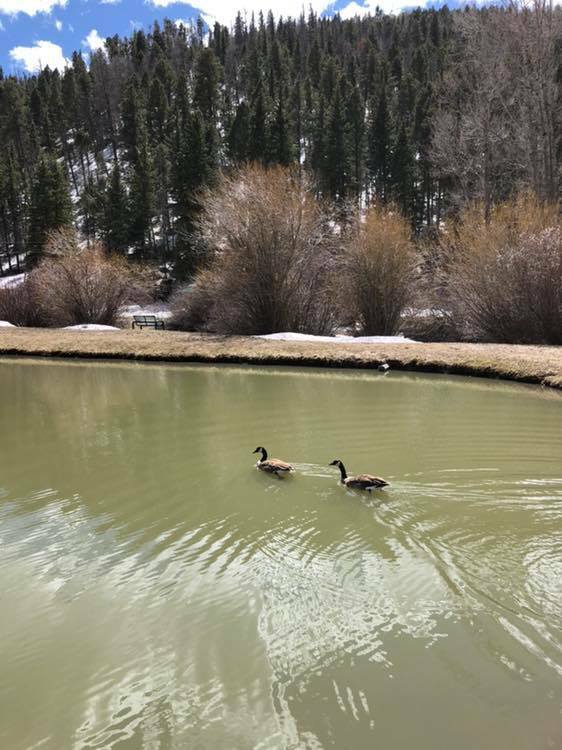 Most of our animal friends are starting to move around, the geese are back, the ducks are happy our pond is starting to melt, and our most popular visitors, the deer, are enjoying relaxing naps in our playground area. However, they are wondering where their human friends are. The mountain sheep are on the move, I saw three groups of younger ones hanging out between Red River and Questa, and car horns do not bother them at all. The bears are still snoozing and we probably won’t see them for a while yet. People who are joining us now are looking for peace and quiet, to just relax and enjoy the scenery. We have writers who love to come during this time, as well as people who just want to get away from the hustle and bustle of everyday life in the city. Whether someone is wanting to sit in the cabin and read or write, shop or eat great food, it is still possible during this time of year. We have stores and food establishments that are open all of the time, some are open on weekends, and a few are taking a much needed vacation. 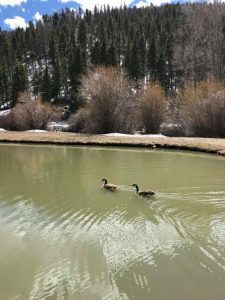 Life in Red River is never boring, it just caters to the many personalities of its guests, from those wanting more excitement that come during one of our many exciting events to those who want a quiet experience of the mountains. It’s time to escape from the craziness of the work world and find Red River, the treasure of the Sangre de Cristo Mountains. Can you hear the mountains calling? I think they are calling your name! Let Rio Colorado Cabins help you answer the call today. You won’t be sorry.